All year the strategy was simple – but pulling it off in a race, especially one the caliber of Nike Team Nationals – was never easy. It just looked that way on occasion. Gun goes off. See Kyle. Stay as close to Kyle as possible for as long as possible. Kyle is Kyle Dawson, one of the five talented, motivated, focused, fun-loving seniors who make up the scoring five for the Nike Team National Champions - Bridgetown XC Club. Ahh, we mean Coatesville High School. 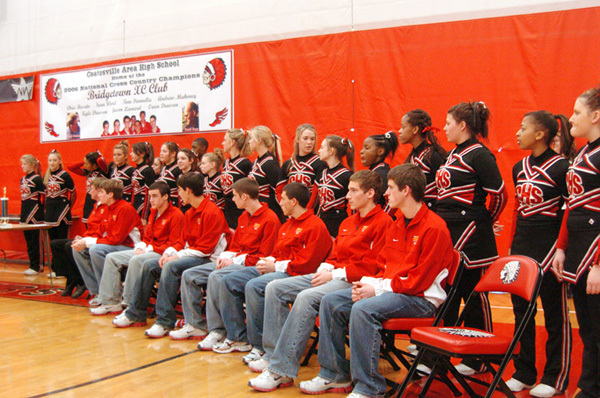 Imagine, a cross country team gets a presentation before the whole school, including the band and the cheerleaders. Cool. This is the story of their race in Portland at NTN 3. A race in which the #7 guy was 5th for a time. In which the season-long #4 or 5 guy was second for the team. And the #2... well, you get the picture. After Kyle, it didn't matter who was next and next to last for the team. It simply mattered that they kept Kyle in sight when possible, and finished as soon after Kyle finished. And it worked all year. Only one team compression (#1-5 man) all year went over a minute. All the rest were in the 40's. Including the last one. At NTN, 49-seconds behind the 8th place Kyle Dawson came the 5th Coatesville runner.